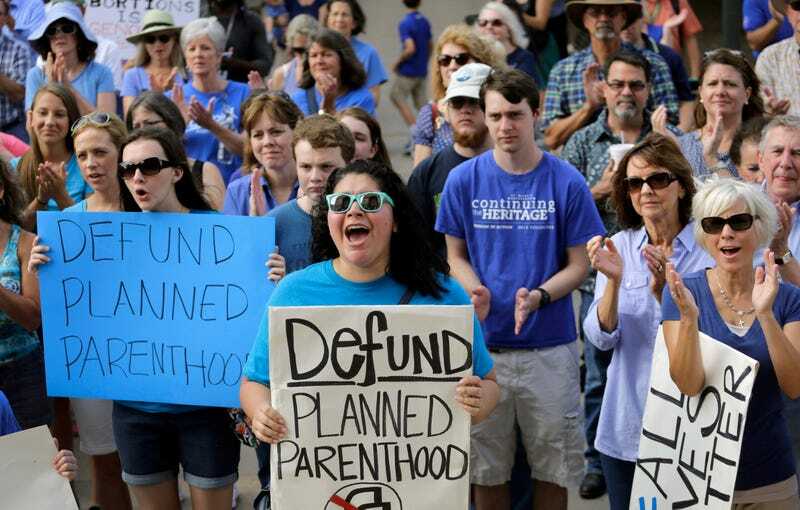 In this July 28, 2015 file photo, anti-abortion activists rally on the steps of the Texas Capitol in Austin, Texas. Texas lawmakers held a hearing this week on a bill that could subject women to the death penalty if they had an abortion. Period, point blank, no exceptions. The legislator behind the bill is Texas state Rep. Tony Tinderholt, a five-times-married Republican out of Arlington who had to be placed under police protection when he first introduced the bill two years ago due to death threats, the Washington Post reports. Under Tinderholt’s bill, abortion would be made a crime without exception, and both women who had abortions and the doctors who performed them could be charged with murder, which is punishable by death in Texas. Observers say the bill has little chance of passing, with even a top Texas Republican charged with deciding which bills get put up for a vote, saying the legislation would not move forward. However, the hearings on the bill come amid a wave of new laws putting further restrictions on abortions in at least a dozen, mostly Republican-controlled states. The White House on Friday is even planning a screening of a controversial anti-abortion film. And naysayers’ position on the Tinderholt bill didn’t deter hundreds of people from showing up to the state capital Monday into Tuesday to testify in support. “Whoever authorizes or commits murder is guilty,” said Stephen Bratton, a pastor from Houston. Speaking for the opposing point of view were some 60 people, including a technology CEO who recently moved to Texas to California. “Murdering your citizens for a medical procedure is pretty extreme to me,” said Caroline Caselli, who said she feared for her female employees. Georgia Legislature Outlaws Abortion With ‘Fetal Heartbeat’ Bill. Stacey Abrams Would Have Vetoed This B.S.